Huge news for Arsenal fans willing to pretend a certain running-the-length-of-the-Etihad-pitch-after-scoring incident never happened: four Gunners legends have been added to FIFA 17 Ultimate Team overnight. And by 'legends', I mean 'difficult exes'. They come as part of a 60-strong player update, with former Newcastle favourite Demba Ba at long last re-added following his January move to Besiktas, and Patrick Kluivert's son Julian, a winger for Ajax, also given a shot at coin-collecting glory. As hinted at in the opening paragraph – and, er, giant screenshot – Emmanuel Adebayor is the biggest name among the Arsenal alumni. Now at Basaksehir, he's rated 78 overall and will set you back around 1,400 coins. That's a bargain compared to the cost of Nicklas Bendtder: now at Rosenborg, the big Dane's new silver card was only available for a maximum possible buy now price of 10K this morning. That cost should come down as more of his cards are found within packs. Fellow silver forward Jeremie Aliadiere, now of Lorient and rated 74 overall, is slightly easier to hunt down; I managed to snap him up for 1,100 coins at lunchtime. And the fourth of those ex-Gooners, Palace midfielder Matthieu Flamini, can already be had for 400 coins via open bids. With most stats in the 60s and 70s, he's unlikely to unseat Pogba and Kante from Weekend League midfields. 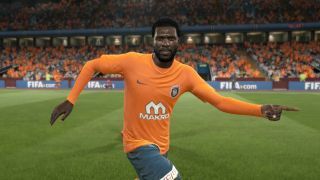 Further names to look out for among this week's update, without a North London connection: former Liverpool winger Ryan Babel, now of Besiktas (rated 75); Cardiff wideman Junior Hoilett, whose 91 rating for Pace will tempt bidders; and another ex-QPR midfield man, Adel Taarabt, now plying his trade at Genoa. A breakdown of all the new cards is available at Futhead. Already looking ahead to next year's game? Then check out the 11 key changes fans most want to see in FIFA 18.